Major step: Brisbane Archbishop Mark Coleridge, BCE executive director Pam Betts, Logan dean Fr Michael McKeaten and St Clare’s foundation principal Chris Thomas turn the first sod at St Clare’s Primary School, Yarrabilba. THE first sod has been turned on St Clare’s Primary School at Yarrabilba. 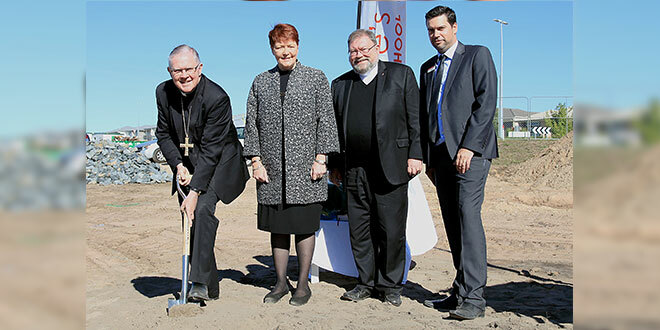 Brisbane Archbishop Mark Coleridge joined Brisbane Catholic Education executive director Pam Betts, foundation principal Chris Thomas, Logan dean and Beaudesert parish priest Fr Michael McKeaten, representatives of the Franciscan Sisters and other guests for the blessing and sod-turning ceremony. During the ceremony Archbishop Coleridge told those gathered on the construction site the celebration was not the beginning of the story of St Clare’s, but an important step forward as the school looked to the future. Archbishop Coleridge said the story of the new school took place within a much larger story. He said St Clare’s was the 139th school within the Archdiocese of Brisbane and was also part of the extraordinary story of Catholic education in Australia. “There’s nothing quite like it around the world,” he said. St Clare’s will be the only school of that name in south-east Queensland. It will be one of three schools receiving pastoral support from the Regents Park parish, which also includes Emmaus College at Jimboomba and St Bernardine’s Primary School at Regents Park. Foundation principal Chris Thomas said the blessing and sod-turning was another milestone in the story of the school. “To have so many people support what we are trying to achieve here is very important,” he said. Mr Thomas said a highlight of the celebration was the number of future students and their parents and grandparents who attended. “That’s why we are all here today,” he said. Mr Thomas said his vision for St Clare’s was for it to be a collaborative and nurturing learning community that was inclusive of all. “It is my hope the community we are building here will be vibrant and positive with an active and supportive parent body, and an enthusiastic and dedicated staff,” he said. BCE executive director Pam Betts said the choice of name for the school was reflective of the values it would represent. “St Clare’s Primary School will value its links with the teachings of the Franciscans in which simplicity, humility, dependence on God, a love for the poor and searching for God in others and the natural world are all valued,” Miss Betts said. For further information visit www.stclare.qld.edu.au. A community information day for interested families will be held on Saturday, July 23, from 9am till noon.